Transport your Powerheart G5 easily with this semi-rigid carry sleeve, with adjustable shoulder strap to accommodate for any height. Offers a zip pocket for accessory storage. Transparent sides allow visual inspection of status indicator and expiration date of electrode pads without the need to remove the unit from case. Sudden cardiac arrest is the leading killer of Australians. Between 15,000-20,000 people die from sudden cardiac arrest annually, and lack of knowledge surrounding treatment coupled with the fact that sudden cardiac arrest is an indiscriminate killer means that tackling this issue is an uphill battle. Generally death due to heart disease is only associated with the elderly or ill. However sudden cardiac arrest can occur in people with no history of heart conditions and who appear to be perfectly healthy. The reason that sudden cardiac arrest can occur in the young and old is that rather than a blockage in the heart’s arteries causing lack of blood flow, sudden cardiac arrest is a result of the malfunctioning of the heart’s electrical system, causing arrhythmia. Arrhythmia is when the heart beats too fast, too slow or in an irregular fashion, preventing blood from flowing around the body and ultimately leading to the victim’s death. This error in the heart’s electrical system can be caused by external triggers in the young, such as electrical shock, drug use or trauma. Unfortunately there is only 2%-5% chance of survival if you suffer a cardiac arrest in Australia. A delay in the provision of CPR and defibrillation is the primary cause of this. Brain death and further terminal damage occurs between 4-6 minutes of collapse caused by sudden cardiac arrest. Immediate intervention is essential but most often not provided. 95% of victims will die before reaching hospital. A defibrillator unit allows bystanders to take control in the face of a sudden cardiac arrest. Easy to use for even the uninitiated, a defibrillator will apply electrical pulses to the heart to ‘shock’ it back into normal rhythm. Every minute lost without using defibrillation decreases the chance of a victim’s survival by 10%, so the benefit of using a unit is significant. Coupled with effective CPR, you can prevent death and permanent damage to a victim. 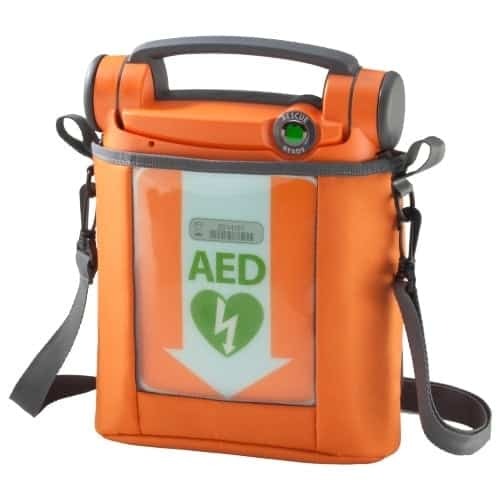 Defibrillators are completely safe to use, are compact, lightweight and completely portable, and come with lithium batteries to ensure power when you need it. It has been acknowledged that access to defibrillators is intrinsic to the success of the chain of survival. As time is such an important aspect of positive intervention, you do not want to run the risk of delayed access to your unit. A carry sleeve for Powerheart G5 is an excellent way for emergency response professionals to transport a unit with ease. The sleeve has a zip pocket for storage of first aid items or pads and to keep your hands free for your work. You can adjust the strap according to your height and the clear, plastic sides allow you to ascertain the working order of the unit without removing it from the sleeve.